After announcing last month that she's been living in a sober house in Manhattan while, apparently, dealing with an addiction relapse, Wendy says she's ready leave and get on with life. Life WITHOUT her husband Kevin Hunter. Last Thursday, news broke that Wendy filed for divorce. There's rumors she put those papers in a gift box with a bow and had it perched and ready for Kevin to open when he got to the "Wendy Show" studio that morning. Dude lost his sh--, allegedly, and went on a rampage around the studio. Y'all know the Wendy staff has already spoken out anonymously, allegedly, saying they can't stand him. This tells us Wendy has likely been preparing to get ghost on that man all while having him right by her side this whole time she's been in sober house and even after she made her return to her show. He's her manager and is a producer on damn near everything she does, so this split could get VERY sticky. 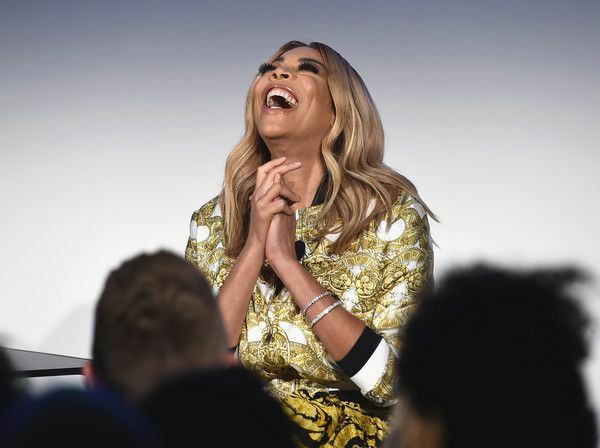 Of course, Wendy didn't outright say "Hey y'all, I divorced the man who's been cheating on me for a decade and had a whle baby with the mistress after they drove me back to addiction!" I mean, all that's alleged, but y'all know what we mean. We will say, these pics of Kevin with the alleged mistress just days before Wendy filed for divorce speak VOLUMES. She went on to say she had created a NEW life for her and their son, Kevin Jr., for post-sober house life. Notice she didn't mention her husband, Big Kevin. It seems sober life has made some things crystal clear for Wendy. She revealed, "Addressing my sobriety/addiction head on has really helped me sort out EVERY single compartment of my life." Double hmph. It's about damn time too. She also said she's on the prowl for a new boy toy. By the way, viewers noticed her wedding ring is off and she replaced it with her good luck flower ring. Congrats to Wendy on her new life!